Tue, Feb 5, 2019, 11:57 am SL Time, ColomboPage News Desk, Sri Lanka. 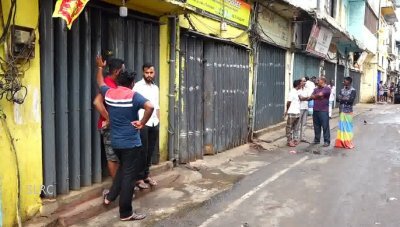 Feb 05, Colombo: The essential food importers and wholesale traders in Pettah have closed their businesses and engaged in a Hartal from this morning to protest the work-to-rule campaign launched by the Sri Lanka Customs trade unions. The Association of Importers and Wholesalers says they incur huge losses due to the trade union action by the Customs officers and demands the authorities to provide a swift solution. Businesses at 4th and 5th Cross Street in Pettah have been closed. Meanwhile, a decisive discussion between the Finance Minister Mangala Samaraweera and former Customs Director General Ms. PSM Charles is scheduled to be held today to resolve the issue. The work-to-rule campaign launched by the Customs trade unions on January 30th to protest the removal of Ms. Charles from the DG post enters the seventh day today.